Ok it’s a Dremel, everybody knows what a Dremel is, there are so many different models and variations and it done my nut in trying to work out what is what. The numbers at the end from what I can work out mean, the number of parts and the accessories. Why did i want one? I have a drill that I use with the wire wheel attachments so that I can clean large areas quickly and without pain. But, that process does not get into the real tight places. Some areas need a delicate touch, such as sanding and grinding flat the rear backing plate for my brakes (for the quick link click here). So it is used for small sanding or intricate grinding or cutting small parts of metal out from the car or making parts I need. Any hobbyist will tell you that you need a rotary tool. You don’t, you can get into small places with screw driver and sand paper but it will take forever and will drive you mad. I bought mine as I want to have the hard work done for me, simple as that. Does it live up to the flagship hype? Again this will be subjective based on what version you buy, There is the soft pouch version which is cheaper nad only has a few accessories, or there is the hard case with everything and the worlds mate in it. I went for somewhere in the middle. My set contained the main tool, flexy drive cable, hard case and the little box of accessories. At the time of the purchase I bought a job lot of genuine accessories, around 150 or so to go with it, it was a bargain I couldn’t refuse. So mine was nearer the £100 mark. The hard case, you need the hard case, it is so much better than the soft option as it protects the tool but also the lid stores the flexy cable neatly out of harms way. There is also a small spanner come screw driver tool for locking the collet or screwing in the parts to the top of a attachement. The case is blow moulded and very sturdy with a couple of nice catches if you want them and a space for a little pad lock! I’m not sure why you would padlock it as a screwdriver would brake the holes that hold the padlock anyway. You should get the hard case. They can be bought from eBay cheap enough. There is the box of accessories, forty-five to start with, the flexy cable adaptor which is critical if you want to use that part. The accessories like all these things is a bit of a con, they say 45 bits, (I am going to call the accessories “bits” from now on), what they mean is, ten fine sanding discs, ten medium sanding discs, two grinding bits, an ez-lock holder and grinding disc or two. Get the idea? So you don’t actually get a lot. I would recommend buying the bits you need as you want them for the jobs in mind. My little pack doubled up on a couple of bits like the sanding discs and grinding which was exactly what I was after. In the end I bought a carry case that could separate all the parts out so I didn’t have them all crushed together. Carving / Engraving / Routing; Carving, engraving and routing accessories for many different applications. Grinding / Sharpening; These can deburr, smooth, grind and clean a variety of materials in any kind of job. Cleaning / Polishing; Include brushes, felt accessories and rubber points to work on steel, aluminium, brass, silver, gold and plastic. Cutting; Two types of cutting bits. Cut-off wheels cut metal, wood, plastic along their edge. Cutting bits are used with the Dremel cutting guide and cut in any direction. Sanding; Include sanding drums, bands, discs, flapwheels and abrasive buffs. Collets / Mandrels / Drill Bit Sets; Miscellaneous extras, like drill bits, collets, mandrels and a Multi-Chuck. I will start with the main tool, This is not to bad a weight for my large hands but I would say prolonged use in smaller hands could make them ache. The cable for the tool is around the two meters mark and seems to be long enough. This version of the tool comes with Ez-twist for the collet. What this means is that you don’t have to use the spanner to lock up and unlock the collet with the bit in the jaws. You just unscrew the collar and move up the collet where the corresponding flats are, press the locking button and twist. This will unlock and lock the collet. So handy and saves messing around. The on/off switch is separate and give a degree of control. The other end of the tool is the a hook to hang the Dremel up on a stand when using the flexy drive (which I will come to in a moment). There is also a variable dial that will select the various speeds. The minimum is 5,000 the max is 32,000 the motor starts and has a very slight slow start-up to get to the full selected speed to enable the control. The motor is quiet for the tool and is well-balanced in the hand and does not vibrate unlike some of the cheaper ones I have tried. Adjusting the speed is turn of the dial, I was expecting a degree of seamless adjustments but it did seem to step up to the next speed rather than infinite variations. The motor is also supposed to have a torque style adjustment that keeps the constant speed that you require. I have yet to see this work correctly, If you press hard then the motor slows down under load it doesn’t keep at the same speed. Sorry Dremel that part is rubbish. The Flexy Drive is a cable with the drive in the middle that takes the weight from your hand into a much smaller hand-held pen like grip. The button on the top is an on only button, release it and the motor stops. To attach the flexy drive you remove the collet, attach the adapter piece that has the square drive and then screw the flexy shaft onto the thread where the ez-lock collar goes. The pen end is exactly the same as the tool as it uses the collet and all the parts fit here in exactly the same way. I use this quite a lot to save the bigger tool holding. I have rigged up a natty system in my man cave. I have a piece of thin rope on the roof under tension to keep it taut, on the rope there is a nylon washer and a hook that allows the tool to be hooked onto it and slide any length or position I want it to be in on my bench. This is much better than the static stand you can buy that only allows a small movement of the flexy drive. 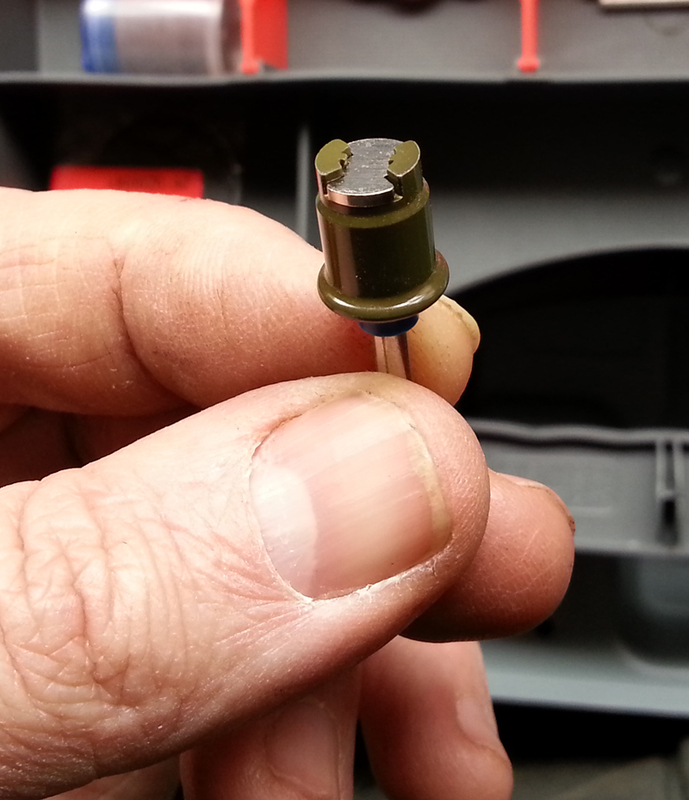 Make sure the flexy drive is not kinked or it will not work or damage it. The ez-twist is a nice little gadget that is used in the collet and the more solid bits such as the grinders or cutters have a cut out in the same shape, this allows the bits to be twisted in and kept under tension by the springs underneath. This will save the little screw driver usage. In the accessory kits there is a like a two-sided open spanner that can be used to lock the collet instead of the ez-lock if you want to be old school about it. On the end of the spanner is a flat part. This flat part will be used to screw up the tiny little screw that the sanding discs use or the more fragile parts. Obviously the pointed grinding tools and the cleaning bits will just lock in and unlock out. The parts available seem to be endless and are being added to all the time, this is truly a customisable tool for your needs. This is where the tool comes into its own. The application is smooth of the motor drive, the noise is minimal, and it feels good in the hand. I have used this with some very delicate work on my car and some cutting of metal on my headlight buckets. Each time it has performed brilliantly and I can’t complain. The flexy shaft is great as well although i would like to see a little lock in button for long-term running as the holding of the button restricts finger positioning. At max speeds this tool is mental, and I can’t see anything that it would not work on. I tend to use it mostly around the 10,000 mark and that is more than enough. I did crank it up to max when I was cutting metal and it outperformed my expectations to be fair. Sanding discs are a bit of a pain, they last well nad don’t seem to clog up. But, as they are screwed in they did tent to split away from the shaft and screw due to fatigue long before the sanding discs were worn out. Shame as if Dremel could sort that out then it would be awesome. I am feeling generous with this rating at the time of writing this. But why so low if it’s a great tool? OK, the cost of the tool is expensive in its own right. The bits are even more mental, these little one inch discs can be made hundreds for pennies. I mean you can go to a DIY store and buy lots of large sheets of sanding paper for a few pounds or dollars. So how the hell can they charge what they do? The sanding discs last as long as you use the most delicate touches. Heavy use will get the job done but the discs wont last at all. Grinding is fine and so is the cleaning. The tool add ons themselves are expensive hence me making my own sliding rail. A replacement flexy shaft nut is £7 on its own, it must cost fractions of that cost to make. So you get my point now. Great tool but at a premium. I suppose the same thing can be said about Snap On tools, But when I work on my car, I sue them all the time so they get their monies worth. This is good but I could have got a cheaper model to do a similar job for the amount of times I have used it so far. But with the body work I have coming up I dare say this tool will make me glad I added it to my tool collection. This is a great tool, it works well and performs very well. But it is a bit of a luxury for me at the moment. I can get by without one so I am lucky I have it to make my life easier. Would I buy it again? Yes, but I would have to shop around to get a good deal in the sales etc. There are third-party bits for this tool that I am going to start looking into using. Then it may be a little more cost-effective. Overall I do like it.